AN Australian bar crawl brings another meaning to the fun activity, given some of Australia’s most remote bars do not have anything around them for thousands of miles. Given the vast expanse and challenging terrain of Australia, you would be forgiven for assuming people would stay in comfortable houses near the coastal areas. However, plenty of people take on the epic journey each year via Highway 1 which connects each state and major city in Australia. Many travel across the dusty orange desert to visit the mysterious Uluru Nation Park in the Northern Territory. 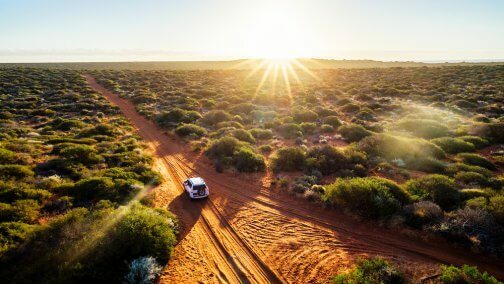 Depending on which way you are traveling inland from, the trip can take anywhere from two days to a month and traveling across Australia can take between four weeks and eight months depending on how much you stop. No matter where you are heading to in Australia, the roads can get lonely. So when a bush bar and a chance to rest for the night comes along, it is incredibly welcome for locals and tourists alike. Some of the bars on this list are left over from a time when they served large mining communities, others are still the focal point of rural communities and each has its own quirk. When copper was discovered in Pilbara in 1872, a whole town sprung up to house those mining it. The town included the Whim Creek Hotel, a bakery, a post office, two pubs, and a police station, swelling to 4,000 people. But today, there are just a few permanent residents and the hotel. Memorabilia of bygone times is draped across the wall and staff are more than happy to tell you a story of the infamous murders, the much-loved beer-drinking camel, and the cyclones that tore the town apart. Address: North West Coastal Highway, Whim Creek, Western Australia, 6718. Opening times: Monday to Sunday, 09:00-22:00. Located at Lot 10 along the legendary Birdsville Track running from Marree in South Australia to Birdsville in Queensland is this quirky bar, hotel, and fuel stop. Its closest neighbors are around 400 kilometers away, with Adelaide being a 17-hour drive away. The establishment dates back to 1860 as a stop-over for cattle drivers, but now it acts as a haven for weary travelers and a base camp for hikers. Address: Birdsville Track, Mungerannie, South Australian, 5733. Opening times: Varying throughout the year, contact Mungerannie Hotel for details. This outback shack oozes character. Established in 1930 by Bill and Henrietta Peirce, the pub has long been a focal point of the tiny community in Daley Waters. The pub has witnessed the murder of an estranged wife, plenty of cowboy’s shootouts and hundreds of drunken brawls, but now it is a just pit stop for travelers touring the Northern Territory, many of whom feel they need to leave a piece of themselves behind. Among the thousands of trinkets of memorabilia is the bra-lined ceiling. Legend has it, the bra trend began when a coach load of women to Daley Waters Pub lost a bet to their male driver and now the tradition has stuck. Daley Waters Pub can be found approximately 600 kilometers from Darwin and 900 kilometers from Alice Springs. Address: Stuart Street, Daly Waters, Northern Territory. Opening times: Monday to Sunday, 07:00-midnight. No list of Australia’s most rural pubs would be complete without a mention of the iconic Birdsville Hotel. As the name suggests, this hotel is located at either the very start or the very end of the iconic Birdsville Track, depending on which way you’re driving. The small airstrip opposite also means adventurers can fly. When the annual Birdsville race starts, the town receives up to 7,000 visitors. Many bring their off-roading trucks, heaps of good spirit and boot-loads of cold frothies. Address: Adelaide Street, Birdsville, Queensland, 4482. Opening times: Birdsville Hotel operates seasonal opening hours with restricted hours during the hot summer months. Phone ahead to make sure it’s open. Nindigully is home to just nine people. The settlement was established in the 1860s along the Moonie River in Southwest Queensland and the number of residents has dwindled over the years, but Nindigully Pub continues to thrive. It is Queensland’s oldest pub and also holds the record for having the longest continual liquor license in Queensland. Room rates at Nindigully Pub start at US$18 and offer a comfy bed and shelter from the desert plains. Travelers can also pitch tents on the banks of the Moonie River and make full use of the nearby shower facilities. Address: Nindigully Pub, Thallon, Queensland, 4497. Opening times: Monday to Sunday, 10:00-midnight. A huge pink building would usually stick out like a sore thumb pretty much anywhere else in the world. But The Pink Roadhouse in South Australia fits in perfectly with the pink and orange sand which covers the Simpson Desert. Up until 2013, the Pink Roadhouse belonged to Lynnie and Adam who wandered into the remote town of Oodnadatta in the 1970s and set up a garage, then a tuckshop and later the bright bar, campsite, restaurant and fuel station known as The Pink Roadhouse. It has since passed hands but still thrives as much as a pub in a town with just 180 residents can. If you are heading to Oodnadatta or want to make a special trip there just to visit The Pink Road House, call ahead first and make sure the grill is fired up, so you can try the famous “Oodnaburger”. Address: Lot 42 Ikartuka Terrace, Oodnadatta, South Australia, 5734. Opening times: Monday to Sunday, 08:00-20:00. 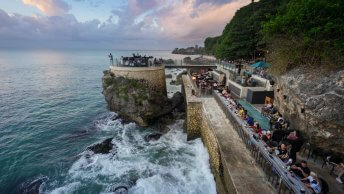 The post Australia’s most remote bars appeared first on Travel Wire Asia. Previous ArticleIs ‘Cargo Class’ the New Low for Airplane Passengers?